Check your local Building Codes for exact regulations and code restriction before installing any fencing product around a swimming pool or spa! "Nationally, drowning is a leading cause of death to children under five." 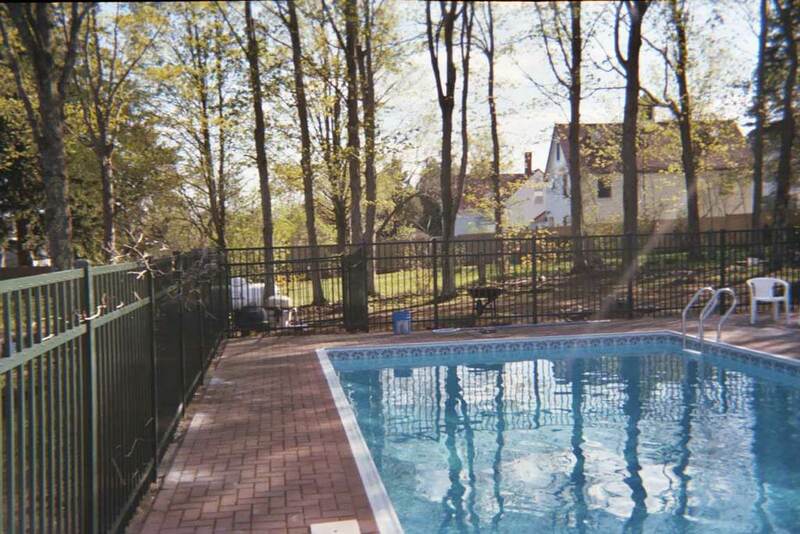 Aluminum Fence - Our featured line of Aluminum Fencing which meets the swimming pool fence BOCA codes and ships nationwide. 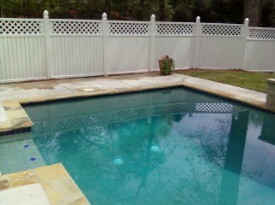 Privacy Fences - Our wood Privacy fencing also meets swimming pool fence BOCA codes. PVC Fences - Many PVC styles meet BOCA codes. Chain Link Fences - Chain link fences meet BOCA codes and are often more cost effective the the above fence types. While a pool can be a great addition to your home, it can also present a danger. With proper planning and attention to swimming pool fence safety you can enhance your lifestyle and enjoyment during those hot summer days. Many local governments have adopted uniform codes for pool safety, one example is BOCA (Building Officials and Code Administrators International) pool safety codes. Spacing of pool fence vertical rails should not exceed 1 3/4", to prevent a child's foot from passing between rails and using horizontal rails as stepping ladder. Spacing of pool fence vertical rails should not exceed 4", to prevent a small child from passing between rails. When swimming pool fence is installed the distance between ground and bottom of fence must not exceed 4". Pool Gates should open out from the pool and be self-closing, with a latch which is self-latching. Pool Gate Latches should be at least 54" up gate. Your house is part of your swimming pool enclosure: In some cases pool location and proximity to home make installation of fencing between them impossible. This may result in a fence on three sides of pool area with the house being the fourth side. If you find this is your situation and you have doors leading from any part of your house into the swimming pool area directly; make sure all doors and other access points are secured at all times (either locked or alarmed) to prevent a child from entering the swimming pool area unsupervised. Pool Alarms - Pool alarms can be purchased at you local pool supply stores which will alert you of unauthorized use or entry to swimming pool area. CPSC (Consumer Product Safety Commission) recommends underwater models with remote alarms (an alarm can be placed inside your house). If windows and doors to pool area are closed you can still receive the alarm on a remote indoor station. CPR (cardiopulmonary resuscitation) - If an accident should happen minutes can make all the difference between life and death. Getting oxygen to a victim using this technique can save their lives. As a pool owner you should register and take these courses so you can respond in an emergency while waiting for emergency services to arrive. Life Saving Equipment - You should instruct all swimmers in the proper use of this equipment and have it out in the open where it can be reached easily in the event of an accident. Young Children should not be allowed to rough house or run in pool area. All young children must wear life preserver equipment while in the pool. Bring a cordless phone in to the pool area so help is only a phone call away. If a child is missing always check the pool first, time is important. Nominate one person to watch children when in pool area so there is always one dedicated set of eyes who knows where the kids are. Stress common pool rules like no diving or running in pool area to prevent other injuries. Young Children should not be allowed to rough house or run and pool area. All young children must wear life preserver equipment while in the pool. Never leave a child alone in the pool area, even if they are not swimming they may accidentally fall into pool and lack the ability to get themselves out.